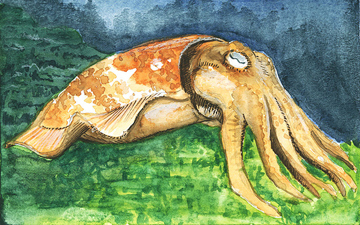 The Broadclub Cuttlefish (Sepia latimanus) is the second largest cuttlefish species after Sepia apama, growing to 50 cm in mantle length and 10 kg in weight. S. latimanus is widely distributed from the Andaman Sea, east to Fiji, and south to northern Australia. 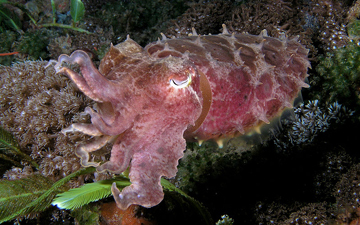 It is the most common cuttlefish species on coral reefs, living at a depth of up to 30 m.
It is known to prey on shrimp and prawns of the genus Palaemon.